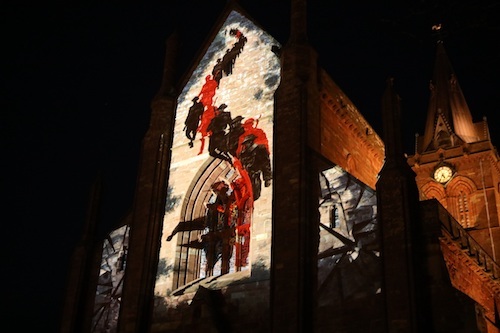 The walls of Kirkwall’s St Magnus Cathedral were transformed this evening as the building became the canvas for a short film marking the centenary of the end of the First World War. The film, titled The Great War: an Orkney Memorial Experience, explores the conflict through the lens of life in the islands at the time. Projected directly on to the red and yellow sandstone walls of the majestic cathedral, the film draws inspiration from the many events and stories associated with Orkney’s wartime heritage, combining archive imagery with beautiful hand-drawn illustration into a visually spectacular animation. The 20-minute film was specially commissioned by the Kirkwall Townscape Heritage Initiative — a Heritage Lottery Fund and Historic Environment Scotland funded project — for the centenary of the First World War armistice. The project is supported by Orkney Islands Council’s Arts Development team. It will run on a loop eight times from 5pm each evening between now and Remembrance Day on November 11. At around 7.40pm each night it will come to a rest on the final image — a tree, made up of the names of Orcadians who died in WWI, in a field of poppies. Glasgow-based specialists Playdead were engaged to create the film and pupils from Glaitness Primary and Kirkwall Grammar schools were involved in the creation of the work. “Spectators will see snippets of what soldiers would have experienced, but also there are scenes which explore how farmers and school children would have been affected, as well as a look at what propaganda people here would have seen, and images from after the war of how the end of the conflict was celebrated and how it was commemorated. The Great War: An Orkney Memorial Experience will run for the final time between 5pm and 8pm on Remembrance Day, 11 November.